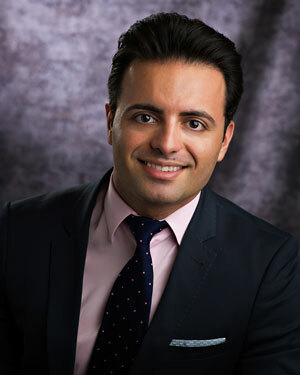 Dr. Nairizi is a Board Certified Interventional Pain Specialist and Board Certified Anesthesiologist who is dedicated to treating patients with a wide array of chronic pain conditions, such as back, neck, shoulder, hip and knee pain. He is very passionate about his patients and his goal is to provide them with the best care possible. He believes that a comprehensive and multidisciplinary approach that is tailored to the patient’s needs provides the best results. He also understands that successful treatment of painful conditions depends on identifying the underlying cause for the pain, not just masking it. Dr. Nairizi is originally from Tehran, Iran. He received his medical degree from the Shahid Beheshti University School of Medicine in Tehran and later obtained a master’s degree from Pennsylvania State University in cellular and molecular physiology. He then went on to complete his residency training at the Drexel University College of Medicine. Upon completing his fellowship training in interventional pain management at the Pennsylvania State University, Hershey Medical Center, Dr. Nairizi moved to Reno to join Nevada Advanced Pain Specialists. Dr. Nairizi is involved with multiple educational seminars with regards to comprehensive and multimodal pain management in the Northern Nevada community. He is currently Co-Principal Investigator in two clinical trials and serves as the Chair of Membership Committee at Washoe County Medical Society, supporting the physician members at WCMS. He is also involved with educating health care providers with new technologies and treatment in the realm of chronic pain management. In 2017, Dr. Nairizi was awarded a silver medal in the category of Best Doctor for the “Best of Reno 2017” competition.